Cincinnato is a very forward thinking cooperative based south of Rome in the village of Cori. It consists of 130 local growers organically farming 100 hectares of vines. The company is deeply conscious of the importance of typicity and biodiversity, and for this reason has always been committed to regenerating and showcasing native grape varieties such as Nero Buono and Bellone. The volcanic-clayey soils of the Lazio are on full display here, bringing a full array of fruity aromas and flavors into brilliant focus. Pizza or pasta with loads of fresh herbs would do justice to this lovely white. The Costières de Nîmes is a small, north-south running appellation that sits east of the Rhone river just before it meets the Mediterranean sea. Until 2004, the appellation was classified as part of the Languedoc region to its west, but is now classified as part of the Rhone valley. This estate was historically an agricultural estate of the Ursulines de Beaucaire since the 16th century. The name Mourgues translates to “nun” in the Provencal dialect, and Gres refers to the rounded glacial rocks that are characteristic of southern rhone terroir. François Collard has been managing his family estate here since 1990, converting the property to organic agriculture in 2004. He is committed to the estate’s motto “ Nihil sin Sole”, Latin for “Nothing without Sun”. "Galets Rouges" reflects that sentiment perfectly - a warm, juicy blend of grenache, syrah, and marselan. Fermented and aged in concrete, and only sulphured minimally at bottling, this red is loaded with raspberry fruit and earth, and structured enough for proteins like lamb and other mediterranean flavors. The white grapes destined for Galets Dorés are planted with northern exposure to protect them from the harsher extremes of the Mediterranean summers. Galets Dorés is fermented in stainless steel at cool temperatures to keep tension and freshness in the wine. Fleshy yet clean, with notes of peaches and white flowers, this white satisfying in the cooler months, and great for heartier mediterranean style fish dishes, or lighter proteins like roasted chicken with herbs. Bugey is on the tip of our tongues, as we just featured Franck Peillot as our December winery of the month. Lingot-Martin is a loose cooperative established by four families in 1970. Best known for their Bugey-Cerdon, ancestral method sparkling rose, here we have a still red made of one of the two key red varieties in Bugey, gamay (the other is mondeuse). There's a lot to like here for lovers of Beaujolais, though the contrast in terroir is stark. Rather than the mostly granitic soils of the rolling inland hills of Beaujolais, we're in the southern extension of the Jurassic Alps, with its complex alluvial limestone. Try it with onion soup, gruyere omelet, or grilled cheese sandwiches. Cantina del Pino was established nearly a hundred years ago by the former director of the Royal Enological School in Alba, Domizio Cavazza. The company is named after a pine tree he planted to mark the birth of his first son, and while he had no winemaking heirs, the Vacca family who took over after him have maintained it ever since, now on their fourth generation. The family uses no chemical fertilizers, and vineyard work is all done by hand, with great respect for the environment. In addition to their three Barbarescos, produced with fruit from the Ovello and Albesani vineyards, two of the best sites of Barbaresco, the family also grows barbera, dolcetto, and freisa. This dolcetto comes from surrounding areas in the Piedmont and Langhe and is vinified in stainless steel. Aromatic and fresh, dolcetto is one of our favorite table wines with all sorts of food, from pizza to pasta to roasted veggies. 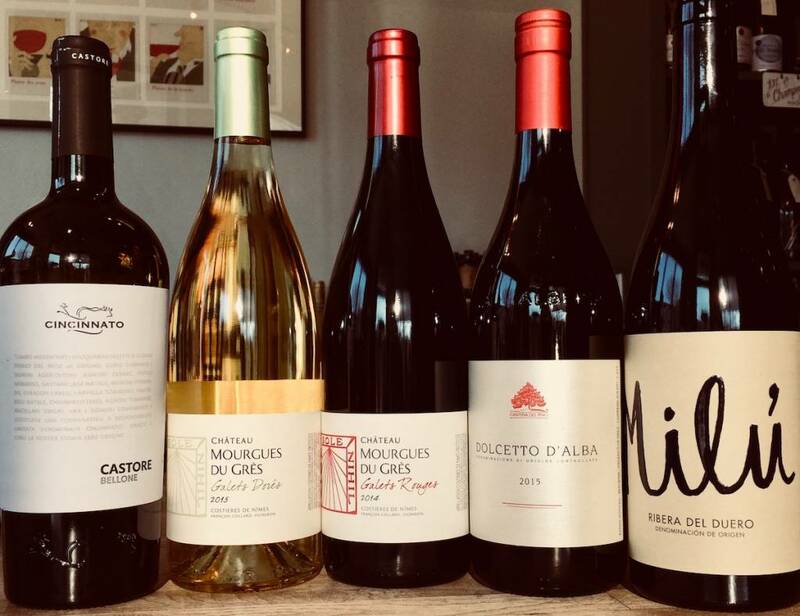 Quinta Milú is young winemaker Germán R. Blanco's tiny operation in the small town of La Aguilera, in the province of Burgos. Blanco calls his estate a "micro winery" and eschews modern winemaking techniques and international varieties. From old Tempranillo vines, he makes wines aged in different types and sizes of casks and barrels. Germán call this, his flagship wine, a “vino de pueblo”, which he translates as “a wine for every day and for everyone.” Aged for Aged a minimum of 6 months in old French or American oak casks.